There are changes that are going to be happening with the blog schedule. I am pushing for 2017 to not only be a great year for all of us but for the blog as well. One of the changes is that every Monday I’m going to post a book that I can’t wait to read. It’s going to probably replace the monthly reads that I was doing last year. 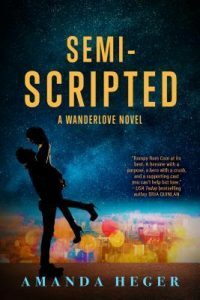 This week’s book that I can’t wait to read is Semi-Scripted by Amanda Heger. I loved her first book in the series Without Borders so much. I really want something to get me out of this January slump. You know that cold weather that is making me want to cuddle by the fire with all my books? I am thinking that this book will be perfect. What’s something you can’t wait to read?